So Fine #50 Thread from Superior Thread - It's SOFT! It's LINT FREE! 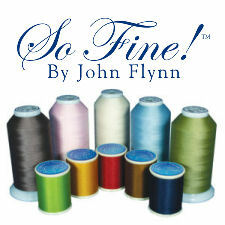 Superior Threads - So Fine Thread is designed for home sewing machines and long arm quilting machines. Superior is changing their Sew Fine line of thread from 2-ply to 3-ply. We have designated the type of thread that is available for each color.